I feel so blessed, and I thank Him several times a day. And, I am blessed because I am where I am thanks to the thirteen years I had with Cathy – I thank her also every day. I am one of those fortunate people who can do what I want to do, when I want to, and as a result I have “too much fun” – there must be a law against that. My desires are not extravagant, there are no needs, only wants, and I want to live a full life, learn, share what I learn, and enjoy each day to the fullest. Hopefully you enjoy my need to share. Today was just such a day. You may recall that in January I finally became a member of Historic Deerfield – only been driving through since 1963 – in my 1929 Model A Ford Roadster – and this fantastic spot is less than an hour from home. And, I still owe you my report of the week long program I attended there in July – THE RIVER, DRIFTING CONTINENTS, DINOSAURS, AND A GLACIAL LAKE – I will never look at rock cuts on a highway the same way again. Thursday I got an email reminder to members for this weekend’s events. 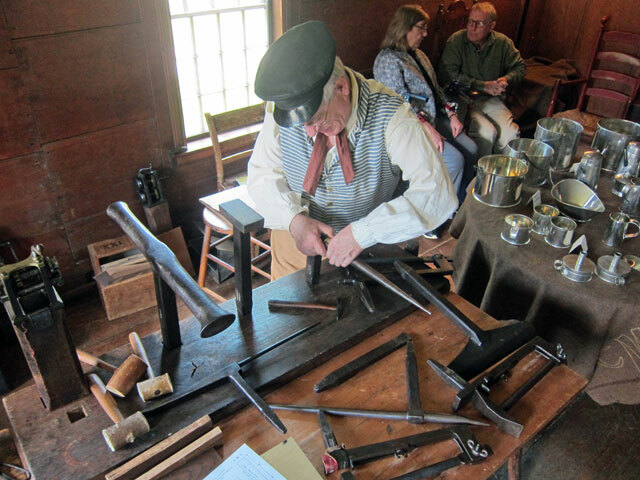 Remember I got “hooked” on tin-smithing two weeks ago at Sturbridge? 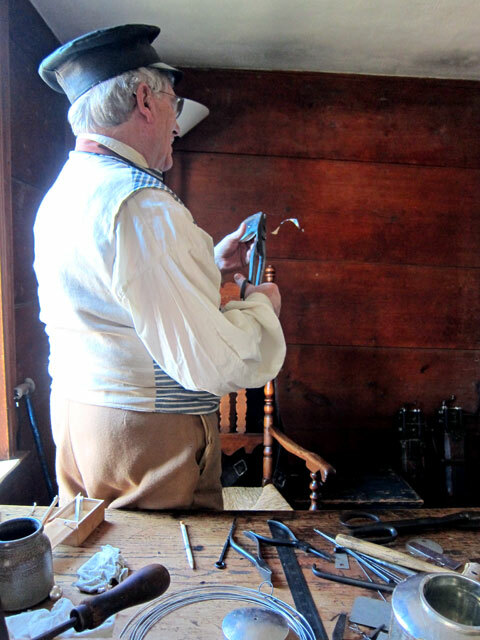 – today was “Historic Trade Demonstration – Tin-Smithing with Bill McMillen.” Ironically, I had spent a great deal of time this week researching ways I can learn tin-smithing. More on that along the way. BLUE BELLE and I left sometime after 9AM, and due to usual fog in the Connecticut River Valley, to be safe we headed south on US Route 5, arriving at Historic Deerfield about twenty to eleven. 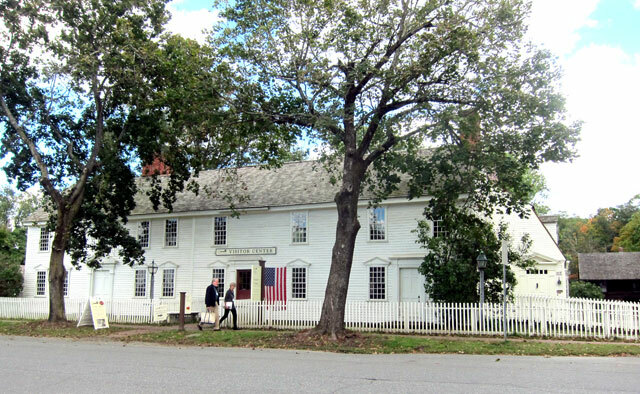 The demonstration was to be in the Hall Tavern section (on the left in the image below) of the Visitor’s Center. The greeter at the Visitor Center looked familiar, ends up he and his wife were in my July Program. 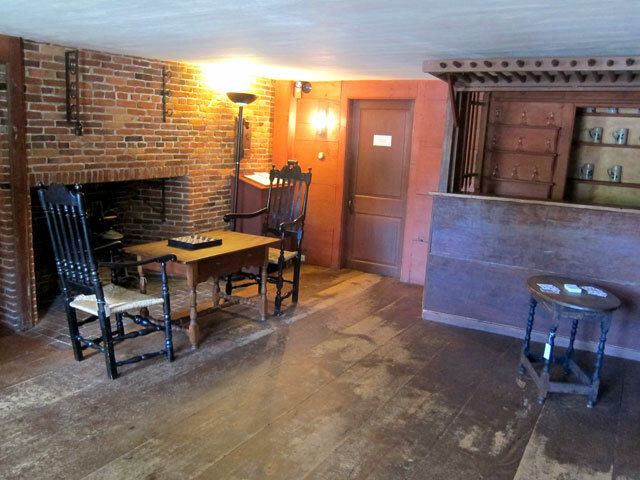 I showed my membership card, got my wrist-band, and headed through the Tavern room to the side room demonstration. I spent over two hours chatting with Bill McMillen, the pre-eminent tin-smith in the US, his wife Judy, and friend Steve (who recently reconstructed the sills for the Bradley law office across the river, and will help me solve my chimney mystery). This week I was googling, and googling classes on tin-smithing. I found a Road Scholar program in October, but it follows a program I am attending in Pittsburgh, and conflicts with my CLARION schedule. bummer. Then I discovered Eastfield Village in East Nassau, NY. WOW is all I can say about the Colonial classes there. Last weekend when I was in Peru and Ludlow was Eastfield Village’s only open day for the year. 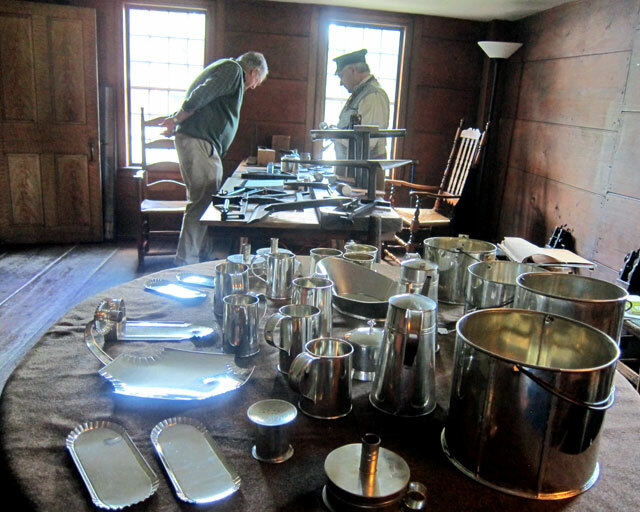 And, in August Bill presented tin-smithing classes (along with the Williamsburg tin-smith, who I also met today). Again, I was too late – but not really since these events were not on my “radar” of interest as yet. I decided I need to learn more about Eastfield Village – apparently a “privately established” and unknown Sturbridge Village. Here is Bill cutting some tin. and, working away. In the rear is his wife, Judy, and friend Steve, who restores Colonial structures. I chatted and chatted with Judy and Steve. They told me so much about Eastfield Village, which they are intimately involved with, and the Early American Industries Association. – now on my list to join. And, I hope in some way I may be able to get involved with their efforts to preserve and share Eastfield Village. Bill was working away, explaining tin-smithing to others. Here he is “raising” the top for a coffee or tea pot. 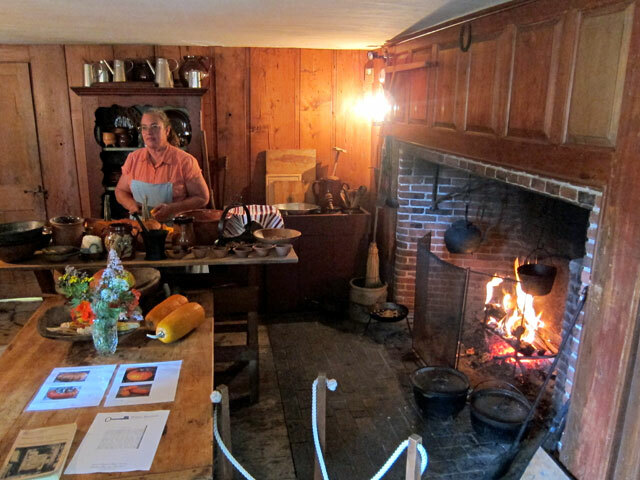 Underway in the next room back was an open hearth cooking demonstration with pumpkin recipes. Of course, two weeks ago I spent about 6 hours with open-hearth cooking. You cannot do justice to Historic Deerfield in a day, particularly when there are special events taking place. I am so glad that I am a member, and close by – I am under no pressure to “do it all,” only “under pressure” to get back often. 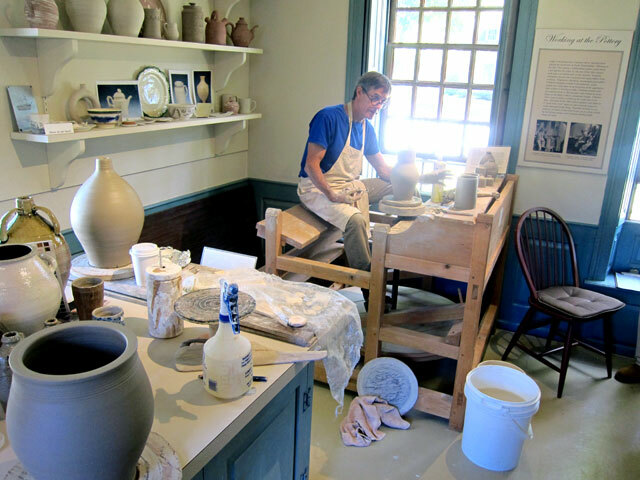 I stopped, for the first time, at the Apprentice’s Workshop at the Dwight House, and listened to the potter at work. Then I headed down to the Silver & Metalware Collection hoping to see tinware, but it was an impressive silver collection (I have always had the book on the Flynt – the husband and wife founders of Historic Deerfield – silver). I was in time for the tour, and glad I was. The building behind is the History Workshop – I was there, and had to see that too. A nice facility for families to experience living history, but wait, “you look familiar” – “you do too,” she replied. It was Faith who was one of the guides during my July program (oh, I forgot to say I saw and chatted with Julie Orvis at the “lunch wagon.” She is the Coordinator of Special Events, and was in charge of the July Program). Faith then toured me and others to the broom shop, and showed us broom making. 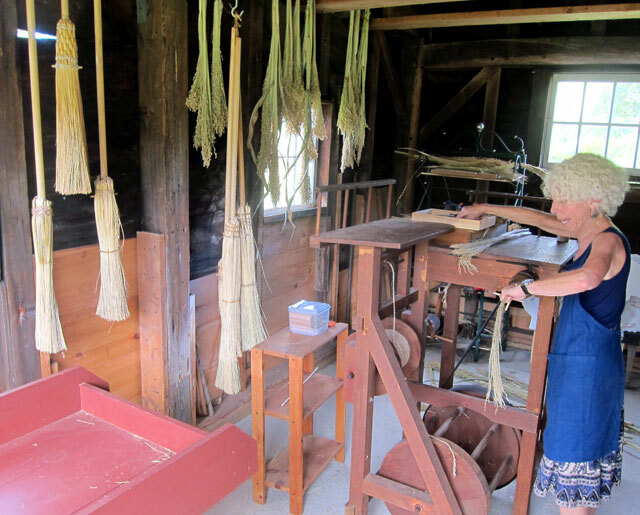 A major broom making center was just down the road in Hadley, Massachusetts. Faith explained the history, and I recall reading about the inventor of broom machinery there, and the special broom corn that was developed. So much to learn ! Here are some views in the shop. Did I tell you I had a great time today? Leaving Historic Deerfield I made two stops at antique centers, and true to “Ray fashion” bought six books, that once sold more than pay for today’s fun. From US 5 and Route 10 I cut over to Turners Falls, then Route 2 East to get Route 63 North, connecting with Route 63 in New Hampshire. This now will be my preferred route when in BB1 or BB2 to Old Deerfield. In bad weather I will defer to the “new car” on I-91. 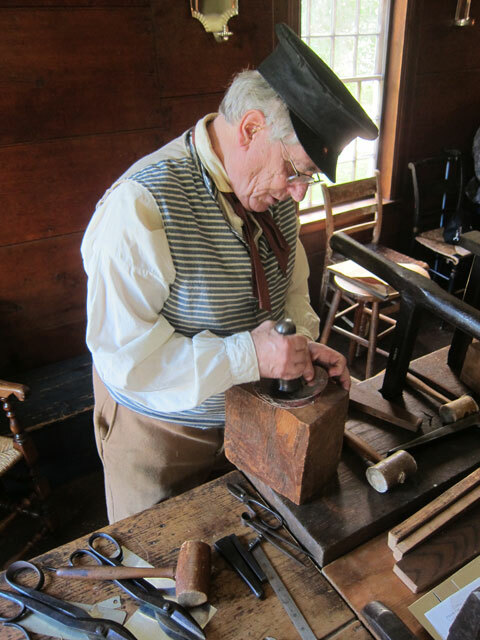 RAY RECOMMENDS – Become a member at Historic Deerfield, and visit often to immerse yourself in all the experiences and learning Historic Deerfield has to offer. As always, thank you for reading through, love, RAY – Shunpiker, Bookseller, Publisher, Printer, and maybe Tin-Smith? This entry was posted in Day (or maybe two) Trips and tagged Deerfield Massachusetts, Historic Deerfield, Route 63, Turners Falls. Bookmark the permalink. It was great to see you at the Lunchbox! What a great serendipity in the middle of my day. Thanks for all your kind words about Historic Deerfield! I can’t wait to see your fully outfitted tin smith shop and the amazing things you’ll turn out. Thanks for another wonderful and informative post.